The machines are definitely rising. The drones, it sometimes seems, are all around us. Commercial, military, scientific–it makes no difference. Stories of alleged terrorists killed in the Middle East by American missiles launched from remotely piloted American aircraft have been commonplace for years. Go to any beach on the island and you’re likely to see a small quad-rotor drone buzzing above surfers and even just people relaxing on the sand. Wedding photographers–like local shooter Sean M. Hower–are starting to use drones. Hawaiian Commercial & Sugar has started to use drones to monitor its 37,000 acres of cane on Maui. In Los Angeles, a Singaporean marketing company recently deployed a drone that tracked people carrying cell phones, then zeroed in on their location so they could receive mobile phone advertisements. While the Federal Aviation Administration (FAA) continues to debate how it should regulate the flying of small drone aircraft by the general public, law enforcement agencies are increasingly looking to robots for surveillance (the Maui Police Department recently took possession of a tracked drone that can climb stairs, open doors and even hold and fire a gun). And now we have drones that can watch whales. But it’s not activity companies that are operating these drones–it’s the federal government. Specifically, it’s the National Oceanic and Atmospheric Administration (NOAA) that’s working with these latest drones. That’s right: the part of the federal government that deals with the weather is now playing around with robots. And they’ve been testing them right here, in the Hawaiian Islands Humpback Whale National Marine Sanctuary–1,400 square miles of protected ocean around our islands. 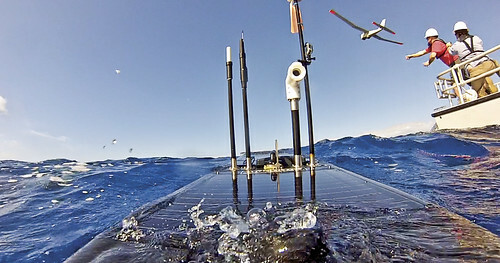 In early February, NOAA researchers began testing two drones (though the operators loathe that term) in the sanctuary waters. Both are very different than the cute little quadcopters that make up the bulk of commercial sales. The first is a video camera-equipped aircraft called the Puma. The second NOAA robot tested out here is even more unusual–it stays in the water. • In 2013, NOAA researchers worked with the US Coast Guard to show how a Puma aircraft could help in responding to arctic oil spills. • A team of researchers from NOAA and the Vancouver Aquarium used a hexacopter in 2014 to follow killer whale pods off British Columbia–the first time such a vehicle was used in killer whale research. Sixty such flights resulted in video footage and 30,000 photographs. • In September 2014, a NOAA P-3 Hurricane Hunter aircraft launched four Coyote drones off Bermuda to help collect data on Hurricane Edouard. • In the spring of 2014, NOAA scientists used a Puma to conduct fish population surveys off the coast of Georgia. 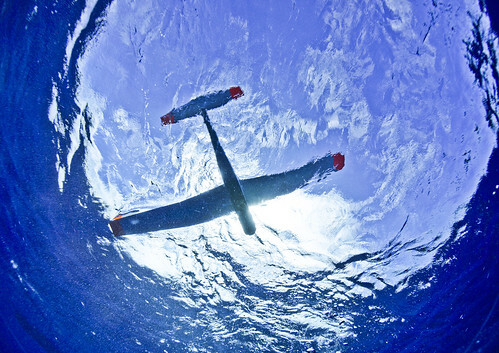 In the sanctuary tests, “two Wave Gliders, equipped with acoustic sensors and positioned a few miles apart, were able to identify and relay the location of a target vessel that entered their vicinity to the operations center,” stated the NOAA news release. 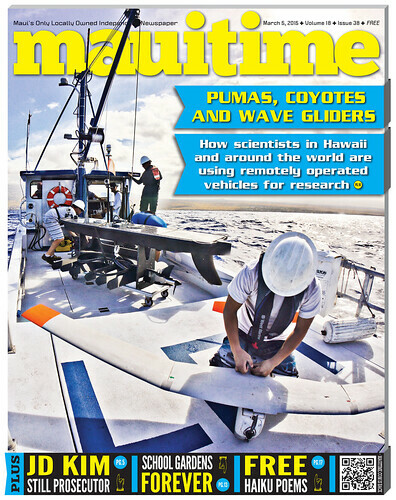 Then researchers took the information gathered from the Wave Gliders and fed it to the Puma, which found and photographed the target vessel. “The test simulated real-life management situations that could include vessels and marine life in distress, marine surveys, and access within marine protected areas,” stated the NOAA news release. So why the sudden fascination with devices that most of the public see as either expensive toys or weapons of assassination? Amazingly enough, modern drones even allow NOAA researchers to follow birds in flight. Recent experiments outlined in Feb. 3, 2015 American Association for the Advancement of Science blog post showed that only dropping down on the birds from a 90 degree angle really spooked birds (in fact, look up the words “birds attack drones” online and see just how unafraid avians are of buzzing copters). Pickett said that they were recently out in Hawaii testing the UAVs because of our “beautiful weather and clear water,” but he also said that the vehicles would be directly useful in the sanctuary. Pickett also said that though commercially sold drones can usually be flown out of the box (though the FAA may someday require pilot licenses for certain drones), training operators in how to use UAVs like the Wave Glider and Puma isn’t easy. As for when these things will be fully operational, Pickett said that hasn’t yet been determined. “We’re testing them in sanctuaries all over the country, and we’re not really ready to deploy them,” he said. That’s probably for the best, because the FAA is still nowhere near ready to issue flight rules governing drones. 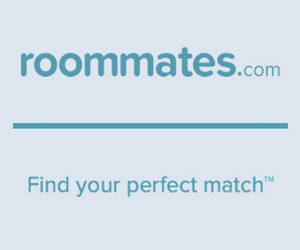 This, despite the fact that the industry is growing very fast. Though the Reuters/Ipsos poll showed that those surveyed were concerned about the use of drones in surveillance, most had no problem with law enforcement flying them. “Sixty-eight percent of respondents support police flying drones to solve crimes, and 62 percent support using them to deter crime,” stated the story. The FAA is still months away from issuing a directive on drones, and public comment could take another year or more. That’s why I wasn’t surprised at Pickett’s answer when I asked him if the recent drone tests in the Hawaiian Islands Humpback Whale National Marine Sanctuary showed any shortcomings.